Preheat the oven to 375. Steam the Brussels sprouts in the microwave on high for 4 minutes, until crisp tender, or steam them on the stove. Set aside. Heat a nonstick pan that will hold the duck legs in one layer over medium high heat. 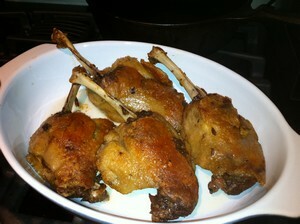 When the pan is hot, add the duck legs skin side down, and cook for 5-6 minutes until the skin is golden brown. Remove the pan from the heat, and spoon enough fat to cover the bottom of a baking dish big enough to hold the legs in one layer. Put the legs in, skin side up, and bake for 8 minutes until warmed through. Discard all but 2 teaspoons of fat from the pan (if you have a lot left, save it for sauteing potatoes or veggies). Return to medium high heat, add the shallots, thyme, and garlic confit. Sweat the shallots for a minute, then add the chicken stock. Bring to a simmer, and simmer for 2 minutes. Whisk in the mustard and creme fraiche. 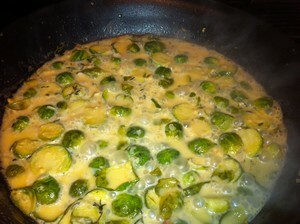 Add the Brussels sprouts, and simmer until the sprouts are warmed through, and the sauce has reduced to coat them. Remove from the heat and stir in the chives. Divide the Brussels sprouts and sauce among four plates, and top each with a duck leg. Serve and enjoy. My rating: 3.5 stars. It was good but it was rich duck leg on top of rich Brussels sprouts. Needed some acid or brightness to lift it a little. I forgot the chives, so that might have done it. 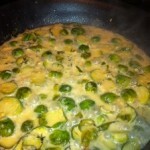 The sauce was a little thin, and I was worried about reducing it too much and turning the Brussels sprouts into mush. Next time less chicken broth, or reduce the sauce before adding the sprouts back in. It took about half an hour to make, if you had all the components. For a main course, you could add a side dish, like mashed potatoes, and it would be plenty of food. This would also work with a sauteed duck breast (see Frank’s rating), or even pork chops in place of the confit.